Late in the year of 1960, my husband and I purchased and moved into one of the oldest farmhouses near Alamogordo, New Mexico. It was nearly a hundred years old and at the western edge of town on a now unused road that had traveled past our farm on through to the White Sands, over the San Andres Mountains, on to Las Cruces and eventually to California. 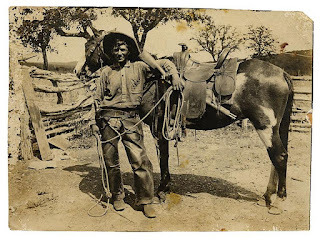 Pat Garret, Billy the Kid, Colonel Fountain, and an array of Apaches, Spaniards, Mexicans, heroes and villains had traversed the road behind our simple wooden, white, pitched-roof farmhouse. It was a quiet place, enclosed in elm trees, fat cotton woods, willows, several barns and a rickety arrangement of pens for sheep, chickens and turkeys. A small house, used for itinerant farm hands, stood catty-corner to our house. It was then occupied by our hand, Gregorio, his wife and their small child. Forty acres of furrowed fields lay south of the houses and were edged on the west by a stingy apple orchard, too old to produce much but a drupelet, but the front yard abounded with fig bushes and apricot, pomegranate and mulberry trees. My husband was a political sort, away at meetings many evenings, and one February evening this was the case. Our youngest daughter had been born on Christmas day two months previously and she was fussy this evening. I was trying to rock her back to sleep in front of the fireplace which was wildly crackling with a hot mesquite wood fire. The older children were in their bedroom but kept getting up and pestering with requests for water or bathroom or "I can't sleep." A storm had begun brewing, beginning with brightening the windows with lightening, followed by close bursts of rambunctious thunder. Rain began pouring down in sheets, blown by a forceful wind. I relented to the children to bring in their blanket and lie next to us on the carpet in front of the fire. As I rocked the baby and hummed a calming lullaby, I noticed the hatch door into the attic was rising up and hovering a few inches above the little frame that held it in place. It would slowly close and then a few minutes later it would hover open again. I kept rocking the baby and watching the hatch open and close. The storm had begun to abate by this time and I began to fear that someone was in the attic and was watching us. I held tight to the baby and continued rocking until the door blew open, I jumped up, and in through the door bounded my husband. I spilled out my story about the hatch while my husband pulled off his winter coat and stood by the fire to warm himself. "It's probably just the draft pushing the door up," he said dismissively, but I persisted and he finally said he would get the ladder and see what was up there. "Maybe a critter," he said, "I don't know how anything could get in there, but we'll have a look"
My husband brought a ladder in from the barn, triangled it the middle of our living room, and climbed to the ceiling with his flashlight. To our surprise, the hatch was constructed from heavy lumber and my husband struggled to lift it and set in onto the rafters. It seemed too heavy to me be lifted by a mere draft of air. "There's nothing up here," he yelled back down. "A thick layer of dust. It hasn't been disturbed, there's no tracks." He swung his flashlight from edge to edge of the attic. Secreted in the corner was a small wooden box, camouflaged with dust, untouched. "It sure doesn't look like there's been any movement up here. Maybe you were sleeping and dreamed the hatch was lifting up." The next morning we viewed the results of the storm. Flood water, deluging down the Sacramento Mountains and overflowing the arroyos had swept across our front lawn and caved in an old hand dug well in our lawn that we were unaware of. We were shocked to find the well; it had been covered with heavy timber and sod and the weight of the flood water must have been too much for the decayed and rotted planks causing them to collapse. The hole was about sixty feet deep and we feared that the children could fall into this pit and even though water didn't rise into the well anymore, it would be a deadly fall and needed to be filled. My husband and Gregorio filled the hole with rocks and dirt and replanted grass on top of the site. After that night, there were changes at the old farm house. Some mornings we would find the breakfast table set with an odd assortment of dishes, a plate, a spoon, a cup and maybe a spatula; strange setttings of dish wares appeared on our table intermittently. Tea towels would be folded or unfolded. Kitchen chairs would be moved, lights turned on or off and soft noises - clicks, scrapes, taps, - nothing uproarious. Sometimes guests would ask who just went into that room and when we investigated, we would find the room empty. Several months later we went back into the attic to remodel and turn the attic into bedrooms since the house had only two bedrooms and we had three children. The dust wafted as we stepped from rafter to rafter. Sitting on the joists in the corner was a small cedar chest, coated with decades of dust. I lifted the top and inside was a collection of embroidered linens with perfectly aligned and administered back stitches, split stitches, french knots - all done in blue two strand thread, a four patch crazy quilt, two dishes bordered with pink roses, a spatula, several wooden spoons, two teacups and saucers, and an assemblage of mismatched spoons, forks, knives. A simple white sleeping gown lay in the chest; its bodice was embellished with white cloud filling stitches which ended below the breasts and bedizened the bottom of the gown into grecian folds. In the bottom of the trunk was a floral printed flour sack, tied at the top with a string, enclosing a pair of tiny pair of lamb's wool booties and a pair of knitting needles with a tiny white cap still in progress interlaced on the wooden sticks. "It's someone's Hope Chest," I told my husband, uncomfortable with this new knowledge. We decided to research the history of the old farm house. Through census records we learned that the original farm was homesteaded by a couple who had a daughter named Margaret who was 18. We found a newspaper article saying that one summer Margaret had gone missing. The newspaper reported that the family had hired a drifter, a young cowboy who worked for the family for about a year and one day the daughter and the hired hand disappeared. Thinking they had eloped, the family waited for their return, but they never came back. Stories filtered back of seeing the hired hand in neighboring Hillsboro, El Paso, or Las Vegas, but no sightings of Margaret were ever reported. We considered the sequence of events on our farm: the storm, the flood, the uncovered well and the appearance of the ghost in our house. We have decided it is Margaret. We theorize that Margaret became pregnant and told the cowboy who did not take to the news kindly. 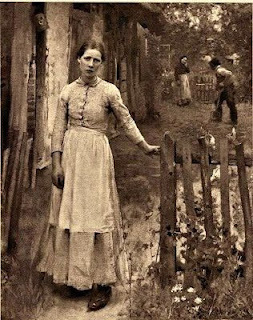 We believe he killed her and dumped her in the dried up well and when the well cover collapsed, she escaped and moved back into the farmhouse. We have lived in this house with Margaret for 55 years. Her Hope Chest sits in the bedroom filled with her unused treasures. She still upsets our routine at times and I'm sure we upset hers, but we are all by now family.